Hanafi and I come from the same state of Kelantan. In short, we are Kelantanese. Never mind that he is a Malay and I, a Chinese; he a Muslim and I, a Christian. As Kelantanese we share a strong bond of friendship and trust. But these are not all. 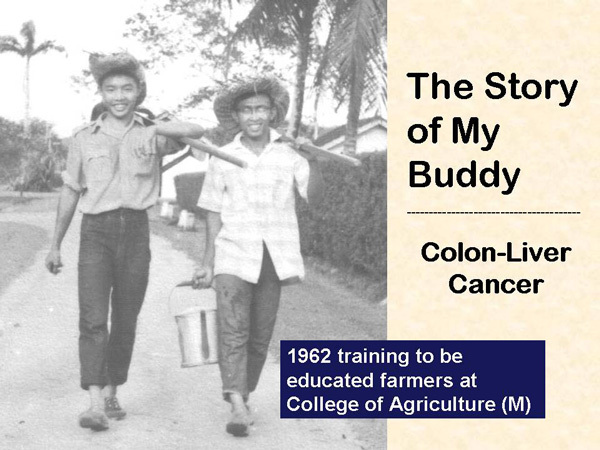 We were classmates while studying at theCollege of Agriculture (Malaya) in the 1960s. And being Serdangites we share another common bond of comradeship. After we graduated from College, we did not get to see each other. One day in October 2004, another Serdang classmate e-mailed me saying that Hanafi was in the hospital, stricken with colon cancer that had metastasised to his liver. He had undergone an operation to remove the diseased colon. Upon hearing this, I called him at his home and asked if I could be of help in anyway. But I did not suggest that he take our herbs. That would be unethical. In fact, by calling him at his home, I had already violated my own code of ethics. I generally do not do such a thing, lest I be accused of trying to promote my herbs. But, Hanafi was my classmate. I thought I would have to do what I did. I provided him with all the information he wanted to know about colon cancer. In his own wisdom he decided to take our herbs. After his surgery, his doctor recommended chemotherapy which Hanafi readily agreed. I respected his decision. Hanafi went through twelve cycles of chemotherapy, not six like most patients. The tumour in his liver did not budge. Chemotherapy was abandoned and he received two treatments of RFA (radiofrequency ablation). This procedure also failed. The next option would be more chemotherapy or a liver surgery. He declined both! He had learnt his lesson. Let him tell you his story …. Each time I go to Subang Jaya to meet up with cancer patients, I requested that Hanafi come and have lunch with me and the rest of our CA Care family. He would do that after his round of golf. While eating, we talked. Listen to these video recordings taken over a period of time. There is no question at all, as of this writing – 2009 and almost five years after his diagnosis – Hanafi is very much alive and well today. There is no greater satisfaction than to be able to help a dear friend to be on his feet again! And there is no greater satisfaction than to know that this friend listens to our advice and is prepared to take the extra mile to CHANGE and heal himself. And with God’s grace and blessings, Hanafi earned his healing.